When did the American dream become a 5,000 square foot home with a cedar privacy fence, 2.5 kids, 2 cars, a boat, 3 jet skis, 7 flat screen TV’s, to watch Netflix and the 978 channels? When did we confuse the pursuit of things for the pursuit of Happiness? Perhaps it has always been this way, and just the “things you need to find happiness have gotten bigger and more expensive.” We seem to work harder so we can have more things that enhance our leisure time. Working harder at a job we hate stresses us out more, so we need to buy something else on credit to enhance our vacation time. The end result, we have to work even harder and longer to pay that new something off. We are like a dog chasing its tail or a hamster running on a wheel. We keep running… but don’t seem to move forward so we try to run faster, never pausing to look at our life from the eagle perspective until life has passed us by and it is to late. This has been said before, and should probably be said more often, “how many people on their death beds wished they had spent more time at work, or more time watching TV?” What if the American dream is the freedom to live wherever you want in our nation? What if the American dream is the ability to pursue your passion? What if the American dream is create a life you love? Is the pursuit of things keeping you from your dream? 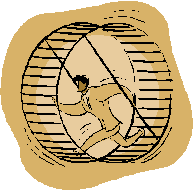 Perhaps it is time to get off the hamster wheel, and figure out where you want to go. It is time to create a plan to achieve your dream. Each of you can probably find 1,000 excuses to not pursue your dream, and if you continue listening to them you will never take that first step. Grandma Moses (world renowned artist) didn’t start painting till she was in her 70’s. Colonel Sanders didn’t start franchising his chicken recipe till he was 65.